So, I was thinking about enhanced ebooks, and decided to try something that, AFAIK, hasn't ever been done before. I recently got hooked on playing Escape the Room games. Not just cell phone apps, where you solve point-and-click puzzles to advance the story, but board games that challenge you to follow the clues and get away before the time is up, real-life games where you go into a room with a group of people and a guide and actually tried to escape by following a carefully constructed scenario, and mail-order subscription games where every month you are snail-mailed a mysterious package that you have to figure out. And I thought: Could something like this be adapted to ebooks? I came up with a concept. A serial killer is emailing me, author J.A. Konrath, and taunting me to prevent his next crime. My first, grandiose way of doing this was to have the killer leave clues about the murder in his emails to me. Then readers could solve the mystery like the sleuth in a mystery novel. But that already exists. It’s called “a mystery novel.” There’s no user interaction. There’s no “solve a puzzle to advance” dynamic that I enjoy in other media. And mystery novels are vicarious, not hands-on and personal. I rejigged my concept, and decided to have the killer send me cryptic puzzles, which linked to his website, www.StopAMurder.com. If I could solve the puzzles and type in the correct answers, it would bring me closer to stopping him. If I failed, someone would die. Since I don't want anyone to die, I decided to enlist my readers to help me. STOP A MURDER was born, combining aspects of both thriller fiction and interactive games. This is unlike any mystery or thriller book you’ve ever read before. You play the sleuth, and as the story unfolds you will be tasked with solving puzzles to prevent a murder from happening. In this five-book series, you’ll uncover the mind and motivations of a nefarious killer who is plotting to commit an unspeakable crime. Each book contains an epistolary collection of emails, texts, and letters, delivered to thriller author J.A. Konrath, by a serial killer. This psychopath is sending detailed, cryptic puzzles and brain teasers that lead to clues about who will be murdered, why, when, where, and how. Some of the puzzles are easy to figure out. Others are much more devious. Do you like solving mysteries? Do you enjoy brain teasers or escape-the-room games? Are you good at spotting clues? Only you can stop a murder. This series works best with an internet connection, using a color e-reader or app to enter answers on the killer's website. A black and white e-ink device will work, but the interface will be smoother if used in conjunction with a computer or smart phone. While each book in this series can be read and enjoyed on its own, the experience will be richer if read in order, and if the internet is used. Over the five book series, you'll need to answer more than seventy puzzles. When you answer correctly, you are rewarded with more clues that can stop a murder and reveal the killer's identity. I've released all five books, and the answer book, on all platforms. They're currently live on Amazon, and they will soon be on Kobo, Nook, Apple, and Google Play. There will also be a paper version, with all 70 puzzles, plus answers. Check out my website for more info. I did a beta test for this a few months ago, via Facebook (I've killed the old posts to prevent spoilers, but the site is still there for readers to exchange hints and tips.) The overwhelming majority (96%) of readers liked it. Since then, I've radically changed the story, and improved the interface. It's bigger, better, scarier, more fun, and easier to use. I hope everyone reading this blog gives it a chance. If you do, please leave a review. Q: Joe, does this mean you're blogging again? Joe sez: I dunno. I haven't really had much to say lately. This project is something completely new, so I thought it was worth blogging about. But in the last six months or so, there hasn't been anything happening in the publishing world that I felt a need to comment on. Q: Why are you releasing this on all platforms? Are you done with Kindle Unlimited? Joe sez: Like many self-pub writers, I've made less money since KU was introduced. That said, I believe Amazon is still the biggest game in town. But for this project, the books are only about 7500 words each, even though they take several hours to complete. It doesn't make fiscal sense to put them into KU, because I'd be getting paid pennies even though readers are getting many hours of entertainment. Also, as you'll see when you begin to read this series, I spent a great deal of time and money on these STOP A MURDER books. I'll never recoup my investment in KU. Q: There has been a lot of talk about KU scammers. What are your thoughts? Joe sez: There will always be scammers. It's unknown if scammers are hurting the KU payout, since payouts are decided after a pay period ends. It isn't a zero sum game when the pot is created after the month is over. And the pot keeps climbing higher. I've heard the All Star Bonuses have been affected, which ain't good. Joe sez: Scammers are certainly taking up bestseller spots. I'm sure that hurts. How much? I dunno. I've never seen any studies about how many ebooks are sold based on bestseller list presence. Having increased visibility is no doubt helpful. And my own buying habits on Amazon have me occasionally scanning the bestseller lists to see if there is anything that piques my interest. But I'd need to see data that differentiates sales between books on and off the bestseller lists to fully understand how much of a boost those books get. Data Guy, you got any ideas? Does being #100 on a list really boost sales as opposed to being #101 and off the list? Q: Didn't you promise the next Jack Daniels book would be out, like, ten months ago? Joe sez: I did. And I'm a jerk. But it will be out soon. So will the next two Phineas Troutt books. All three books are basically finished. I just need to do rewrites. Q: I noticed that all of your Jack Kilborn titles are now JA Konrath titles. What happened to Kilborn? Joe sez: Konrath is the bigger brand, so now all Kilborn books are Konrath books. But I am still going to continue that horror line, and have several horror books coming out next year. They'll just be published under the Konrath name. Q: What happened to your bad movie blog? 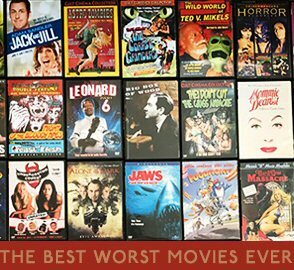 Joe sez: My son, Talon, and I are still watching bad movies. He's in college, and I'm just waiting for him to put our notes online. We'll get back on it. And eventually compile the reviews into a book. 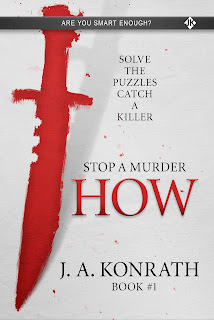 Q: You've got the STOP A MURDER series, and three more novels out by the end of the year. What's next? Joe sez: I'm putting the finishing touches on a children's rhyming picture book, and I still need to finish the TIMECASTER trilogy, do sequels to THE LIST and ORIGIN, and finish the horror novels I've already potted out (THE GREYS, CLOSE YOUR EYES). Q: Will there be more Jack Daniels? Joe sez: Yes. Jack will be back in the upcoming novels OLD FASHIONED and SHOTS. Not sure which will come out first. I hope to get everything I've mentioned above done by the end of 2018... unless STOP A MURDER does well. Then I'm dropping everything and doing a sequel. I already have something in mind. Q: And what about this blog? Joe sez: If writers have a topic they'd like my opinion on, ask me in the comments.